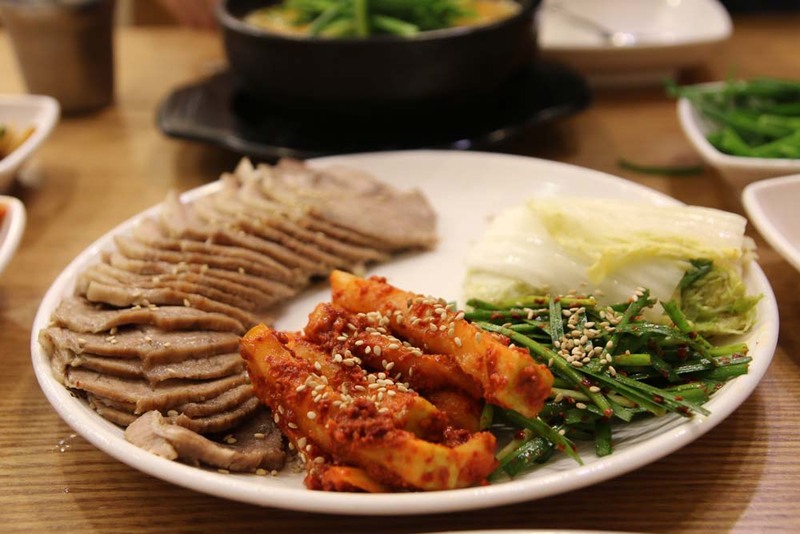 TOP Restaurant – The best value suyuk in Seoul! 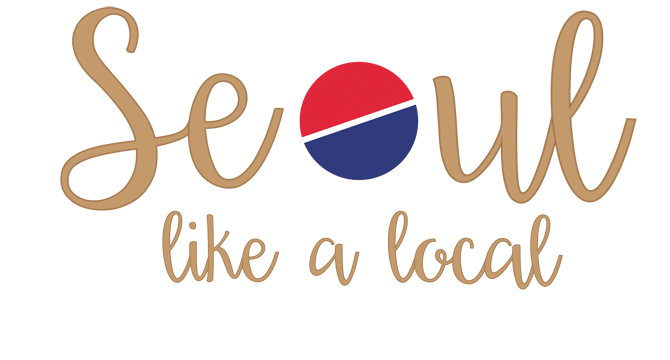 In this post I want to share with you a restaurant that really impressed me. 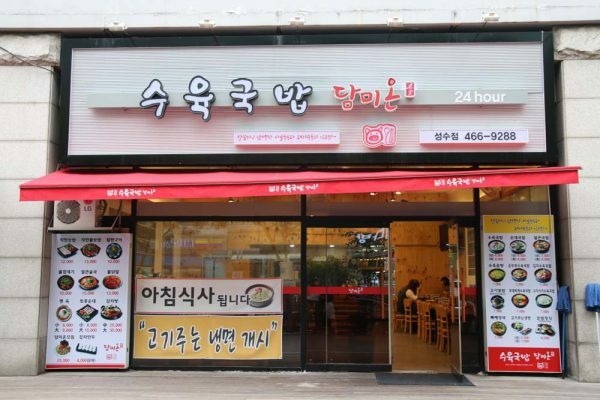 An apparently normal looking restaurant holds a secret! Probably the best value suyuk (수육) that you can find in Seoul! Suyuk is a dish that consists of boiled pork meat cut in thin slices and served with vegetables. The remarkable thing of this restaurant is the price. 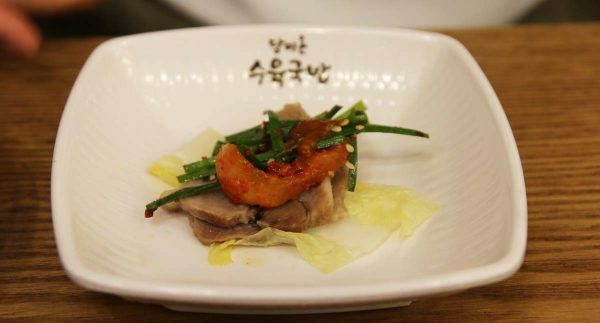 This dish usually costs around 20,000 won but you can get it here for only 12,000. In this restaurant they serve it with cabbage, chives and radish. The best way to eat it is making a wrap with the cabbage. This wrap will make an amazing explosion of flavours in your mouth… I really love it! 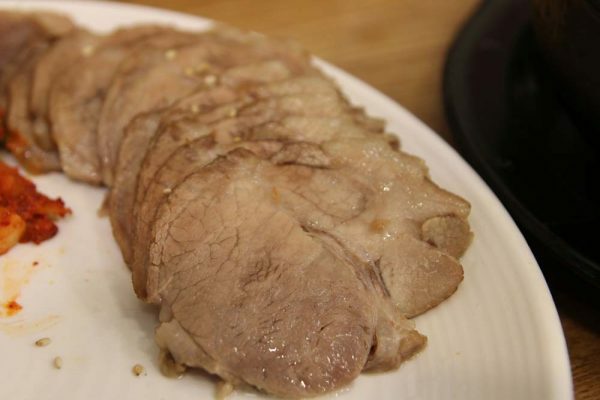 *As for the side dishes, you can also ask for a free refill of the vegetables that come with the pork meat. 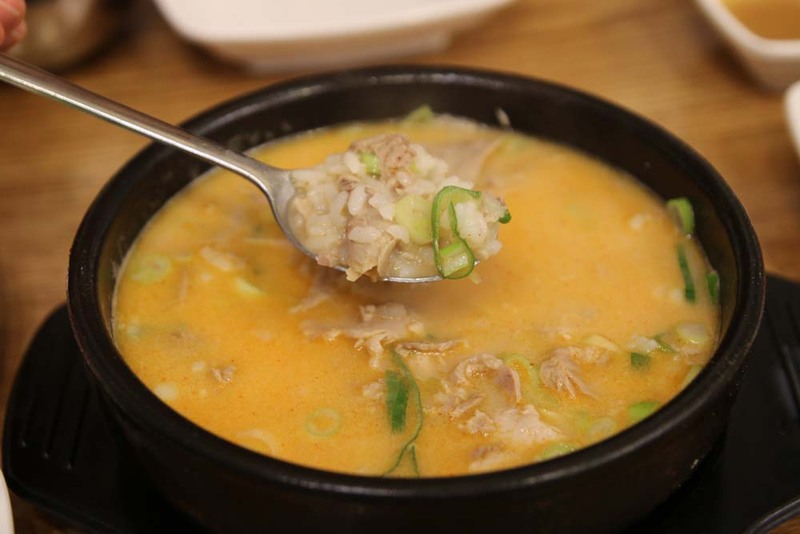 We also ordered a hot pork soup (수육국밥), which comes with rice. Actually, we were 2 people and we couldn’t finish all the food. 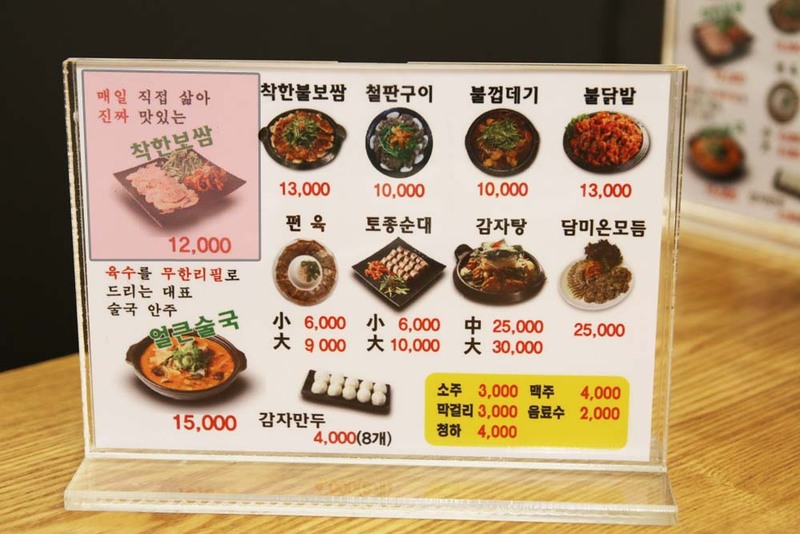 The price of the soup is 6,000 won. The soup was tasty and the meat was well cooked. I personally like to put the rice inside the soup, so you can do that too if you want. In addition, if you finish the soup you can ask for a free refill. 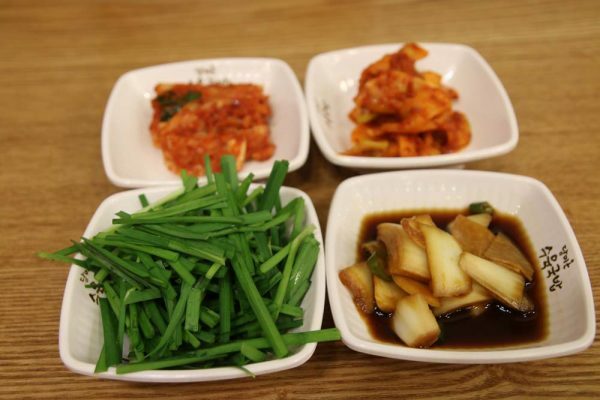 Nothing good or bad to say about the side dishes, just average quality. 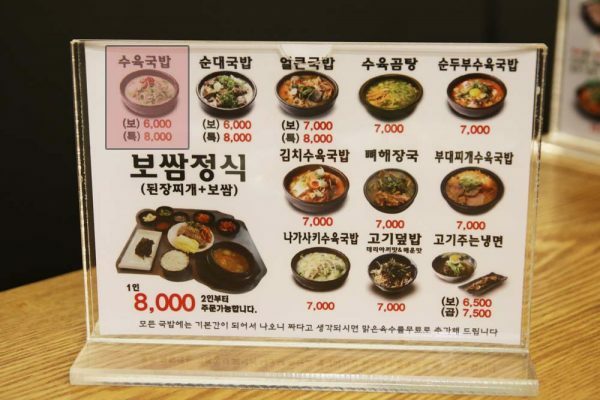 The menu is only in Korean, so I highlighted what I ordered. You can simply point the pictures on the menu and say “주세요” (juseyo), which means “please, give me”.